18-wheeler loses container on Katy Freeway near Houston Ave.
An 18-wheeler lost its load on the Katy Freeway near the Houston Avenue Bridge early Thursday near downtown. HOUSTON – An 18-wheeler lost its load on the Katy Freeway near the Houston Avenue Bridge early Thursday near downtown. 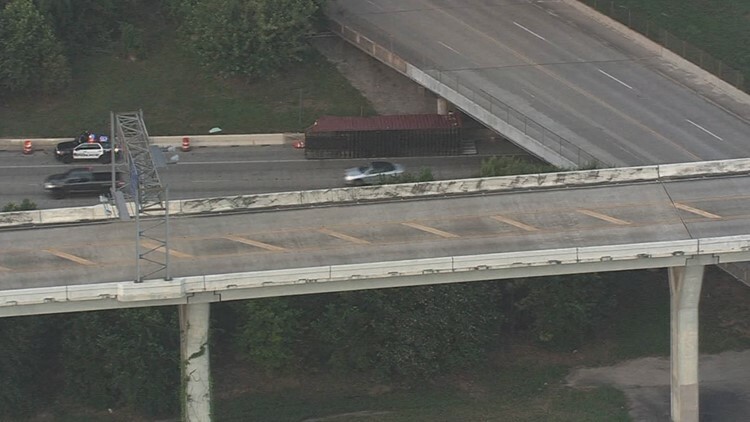 Views from Air 11 show the container on its side under the bridge with the truck pulled up ahead. This is heading east on the Katy Freeway. So far there are no traffic delays, but that could soon change as crews begin removing the container and checking to see if the overpass was damaged.